“Play it, James” – three words that will be instantly recognisable to Elvis Presley fans. You’ll hear Elvis use them to introduce the lead guitar break in The Wonder Of You, a No 1 single in 1970. Recorded live in Las Vegas in February of the same year, the song stands as a public reminder of the high regard in which Elvis held guitarist James Burton, who’d joined his band the previous year. The players he assembled – guitarists Burton and John Wilkinson, bassist Jerry Scheff, drummer Ronnie Tutt and keyboardist Glen D Hardin (who replaced Larry Muhoberac in 1970) – were eventually christened the TCB Band. The initials stood for ‘taking care of business’, a slogan that Elvis adopted and, in the form of a gold logo, pretty much trademarked. Burton, the unofficial band leader, already had an impressive CV. He launched his career aged just 14, backing the likes of George Jones and Johnny Horton on classic US radio show the Louisiana Hayride. He went on to join Ricky Nelson’s band and record with a string of legendary artists, including Merle Haggard, Buck Owens, Buffalo Springfield and The Everly Brothers. In 1972, while still picking his way around America with Elvis, Burton got a call from a guy called Gram Parsons, who hired him, along with Tutt and Hardin, to make a record. That record was GP and was followed by another, Grievous Angel – both now considered seminal works and landmarks in the history of country music. After Gram died in ’74, Burton went on to perform with his partner-in-harmony, Emmylou Harris, in the highly regarded Hot Band. There’s more, including work with John Denver and Johnny Cash, but you get the idea. My only previous experience of James Burton live was in 2003, when I attended an ‘Elvis: The Concert’ event at London’s Docklands Arena. While the main attraction was doing his thing on a large screen above the stage, his original backing musicians – including Mr Burton – were playing live, presumably with a click track to make sure they were in sync with the film. Despite the lack of Elvis, tonight’s gig at the 300-capacity 100 Club in London’s Oxford Street is the more exciting proposition, even though it’s the Presley connection that seems to have brought most fans here. 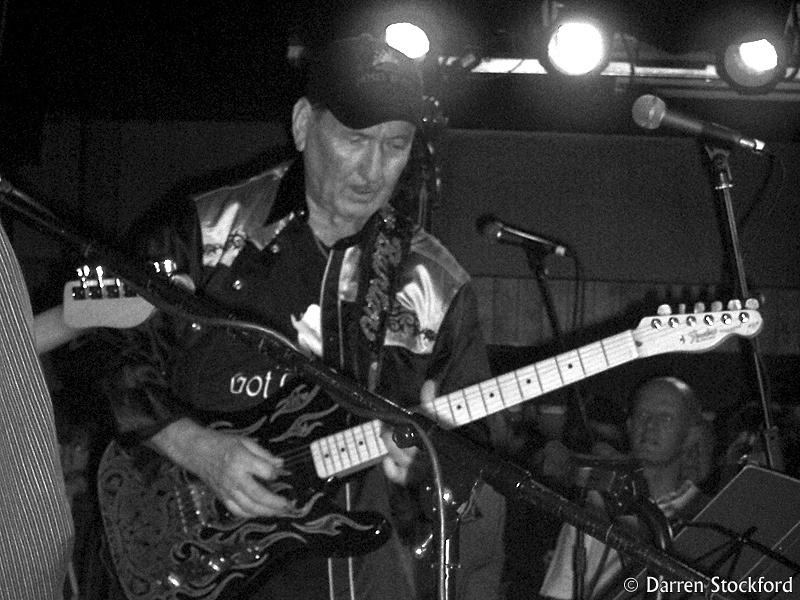 Seeing James Burton at close range, when he’s able to cut loose and make music that isn’t tied to a video, is a mouth-watering prospect. 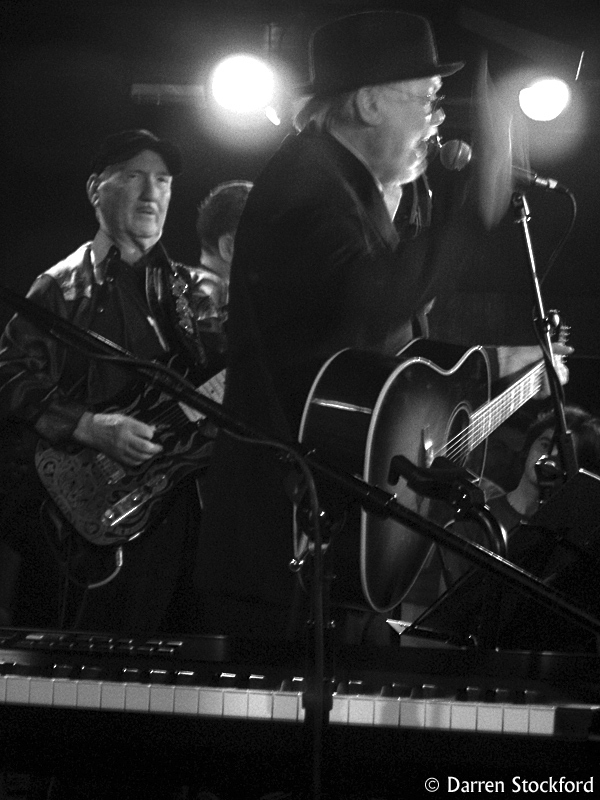 Sharing the stage and the bill is vocalist Billy Swan – who, among other achievements, wrote and had a 1974 hit with I Can Help, which Elvis recorded in 1975 for his Today album – and the Grundy Pritchard Band, who, funnily enough, I saw in 2004 backing Scotty Moore. They don’t just play gigs with Elvis’s guitar players, but I guess they must have come recommended. And why not? They’re a fine band – a real ‘feel it and fly’ kind of outfit, and Pete Pritchard’s upright bass gives them a solid rockabilly edge when required. After a half-hour set from the Grundy Pritchard guys (which includes superb versions of The Race Is On and Cherokee Boogie) and a two-song opener from Swan, Burton makes his entrance to rapturous applause and leads the band through choice cuts from his sizeable back catalogue, kicking off with Dale Hawkins’ Suzie Q and taking in a handful of Ricky Nelson numbers, such as Lonesome Town and Hello Mary Lou. It all goes down extremely well. Swan is a strong vocalist, as capable of singing rough rock as gentle ballads, and a personable frontman. And the 67-year-old Burton plays just like the 30-something guy I’m used to seeing on my Elvis DVDs. Sporting his custom flame-design Telecaster and signature strap (and cap), he plays as much to his bandmates as to the crowd, giving the impression that this is music-making in its purest form – a bunch of people who’ve come together to inject some emotion into a room. When Burton speaks, it’s to say hi, thank everyone for coming out and reassure us that he won’t take up any more of our time talking, as there’s music to be played. I see no ego – just a guitarist playing great rock ‘n’ roll and losing himself in the task. Unsurprisingly, the biggest reception is reserved for the numbers that Elvis performed, the first of which to make an appearance is a brooding Steamroller Blues. For Guitar Man, Swan heads to the back of the stage while Grundy takes the lead vocal, leaving Burton to trade licks with the other guitarist, whose name I don’t catch. It’s an exciting display – a contender for my highlight of the night until they top it with a funky Polk Salad Annie that, for one moment, has me imagining I can hear The Sweet Inspirations’ backing vocals. The show draws to a close with Can’t Help Falling In Love – a restrained version, more in tune with the Blue Hawaii cut than the towering anthem it blew up into in the ’70s, when it brought the curtain down on Elvis’s live shows – and, finally, an encore of Johnny B Goode, which allows Burton to rock up another storm and bring back memories of the opening montage of (1972 movie) Elvis On Tour. Fifteen minutes later, he’s out of the dressing room and signing autographs for those in no hurry to get home. There’s a lot riding on gigs like this. For fans, it’s a risky business seeing musicians whose work you admire from years past in a modern setting. While a lacklustre show can never take away your enjoyment of their recordings, it’s disappointing to find out that the fire’s gone out on their talents. I’m pleased to be able to say that James Burton’s fire, like the design on his guitar, is still raging.